The IAEA believes that while there is enough uranium to feed nuclear reactors for a century, the current oversupply in the market is finite. During his opening address earlier this week at the International Symposium on Uranium Raw Material for the Nuclear Fuel Cycle (URAM), Yukiya Amano, director general of the IAEA, reaffirmed uranium’s position as a vital resource for nuclear energy. “There are now 451 nuclear power reactors in operation in 30 countries,” Anamo told delegates at the fourth URAM symposium, held in Vienna this week. He went on to note that there are an additional 58 reactors currently under construction, while another 30 countries are considering introducing nuclear power to their grids. The 451 operating nuclear reactors, which are exclusively fueled by uranium, provide roughly 11 percent of the world’s electricity and a third of all low-carbon electricity. Because nuclear power is one of the lowest-carbon technologies for generating electricity it is vital to assure that uranium supply is sustainable into the future, and that was a key topic at the gathering. “In my opinion, it will be difficult for the world to meet the twin challenges of securing sufficient energy, and limiting the average global temperature increase to 2-degrees centigrade, in the coming decades without making more use of nuclear power,” said Anamo. 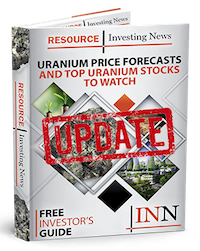 While the IAEA believes there are sufficient identified uranium resources to fuel nuclear reactors for well over 100 years, the agency thinks the current oversupply is finite and will not last. The director general, noted, “[i]t is therefore important that this vital resource is mined, produced and managed sustainably.” Addressing environmental concerns now and those that may arise in the future will also be paramount for the uranium sector moving forward. It is evident uranium will continue to be a crucial component of the nuclear fuel cycle; however, just how much uranium may be up for debate. Development of the new generation of nuclear power reactors is already underway. These modern nuclear reactors will require less uranium, and may even be customizable, ranging from small to mid-sized to modular. There are even some countries interested in exploring the addition of the thorium fuel cycle to their grids. Olga Skorlyakova, senior project manager at World Nuclear Association, also emphasized at URAM how important it is to ensure future uranium supply. During her speech at the event she referenced The Nuclear Fuel Report: Global Scenarios for Demand and Supply, released last fall. “Global known resources of uranium are more than adequate to satisfy reactor requirements to well beyond 2035,” Skorlyakova said. That said, she went on to note that increased funding for exploration will play a key role in securing uranium supplies well into the future. The four-day symposium ended on Wednesday (June 27), with other topics including uranium procurement and sustainability, as well as transparency and environmental awareness.